Gallops is a lovely, quaint restaurant that’s known for its old-world charm. You walk in and feel like you’ve entered some fairy-tale, vintage world. The food here is simply the best on this list as well as other ones. That, along with its serene ambience would give you the perfect date night. Dome can be found on the top-most floor of Hotel InterContinental. The roof-top restaurant offers you a breath-taking view of Marine Drive and the sea beyond. The candle-lit ambience is beautifully romantic and ideal for a date night! They also serve sheesha which is priced at Rs. 3000. The food and drinks are also expensive, but the ambience and the view make up for it. The down-side is that they only serve starters (mainly non-veg), sushi and drinks (no main course). Situated just by the beach and away from the busy city-life of Mumbai, Boardwalk in Alibaug is the perfect place to visit for a quiet getaway. Downside - The food is average and the prices are not. But it’s the perfect place to spend a relaxing Sunday afternoon. Best way to reach there – 20-30 min ferry from Gateway of India. One of Mumbai’s prettiest restaurants, for sure. The romantic French-inspired décor and its fusion of modern and vintage interiors make it the perfect place for a date. Love the fuchsia theme. To match its super-pretty décor, the food presentation is rather attractive as well! You MUST try their spaghetti. Oh, and they have two outlets! This roof-top restaurant has low tables, shamiana style decor, and a traditional ambience. It also has a stunning view of the ocean. Sheesha is also available! 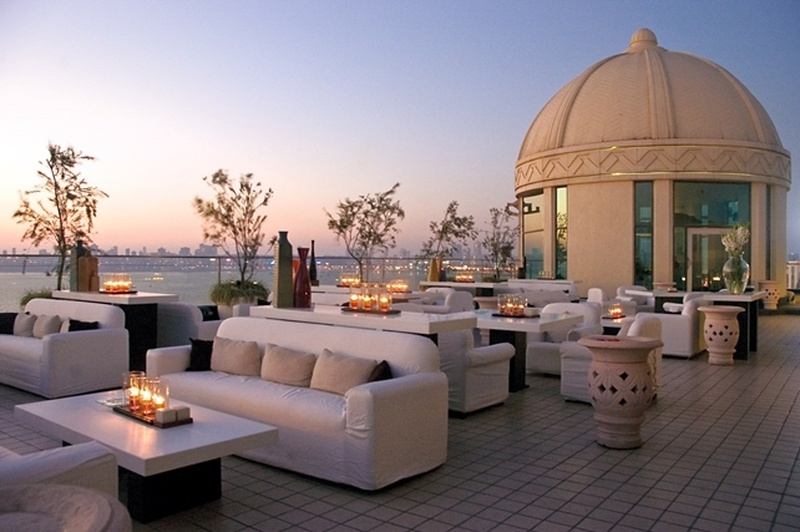 Situated on the roof of Four Seasons Hotel, Worli, Aer gives you a magnificent view of the Mumbai skyline. Get here just as evening arrives to watch a wonderful sunset over good food and drinks. Though, it is very steeply priced! All images belong to their repective owners.